BUSSMAN FWH-125A 500-VOLT, STUD MOUNT HIGH SPEED BLADE FUSE 125-AMP. EATON CUTLER HAMMER 15RBA4-1E-A GENERAL PURPOSE CURRENT LIMITING FUSE. BUSSMAN COOPER JT60060 600VAC 60A BUSS FINGER TOUCH SAFE FUSEHOLDER. NEW: Positrol S&C, Fuse Link 279008R1, 8 AMP T Speed 23"
This is a New Positrol S&C Fuse Link, 279008R1. It is an 8 amp link with T speed, and a total length of 23". Installation by Certified Installers Only. SQUARE D M10/16SFL FUSE BLOCK FOR 1/4 X 1-1/4 FUSE (20 PACK). Brand new! See photos for details. BUSSMAN 170M3667 SQUARE BODY HIGH SPEED FUSE, 660V/700-VOLT, 315-AMP. LITTELFUSE L70S-200 POWR-GARD HIGH SPEED FUSE, 700VAC, 650VDC, 200A. TRON KBH-400 RECTIFIER FUSE, TYPE KBH FUSE, 400-AMP, 500-VOLT. BUSSMAN FWH-700A 500-VOLT, STUD MOUNT HIGH SPEED BLADE FUSE 700-AMP. COOPER BUSSMANN FWH-175B FWH SERIES STUD-MOUNT HIGH SPEED FUSE, 175A, 500V. LITTELFUSE JTD-1-ID POWR-PRO TIME-DELAY CURRENT-LIMITING CLASS J FUSE, 600V, 1A. 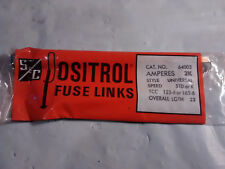 LITTELFUSE 0481002.HXL 481-SERIES ALARM INDICATING FUSE, 2A, 125V, (100-PACK). COOPER BUSSMANN NOS-300 ONE-TIME GENERAL PURPOSE CLASS K5 FUSE 600V, 300A. BUSSMAN T-30 DUAL-ELEMENT TIME-DELAY EDISON BASE FUSE 125-VOLT, 30-AMP (4 PACK). EATON CUTLER HAMMER 15RBA4-150E EXPULSION BORIC STD FUSE REFILL. EATON CUTLER HAMMER 38RBA2-65E EXPULSION BORIC STD FUSE REFILL. LITTELFUSE KLPC-601 HI-INTERRUPTING TIME DELAY LIMITING FUSE, 600V, CLASS L.
COOPER BUSSMAN LPN-RK-60 LOW-PEAK, 60A 250VAC 125VDC, TYPE RK1 DUAL ELEMENT FUSE. 400 AMP /// 500VAC 450VDC /// POWR GARD. NEED YOUR ITEM FASTER ??. LITTELFUSE LEB-AB IN LINE WATERTIGHT SINGLE POLE MIDGET FUSE HOLDER. BUSSMAN COOPER ATC-1 ATC BLADE 1AMP FUSES (100 PACK). EATON CUTLER HAMMER 15RBA4-100E EXPULSION BORIC STD FUSE REFILL. LITTELFUSE L70S-125 POWR-GARD HIGH SPEED FUSE, 700VAC, 650VDC, 125A. BUSSMAN GLR-15 NON-REJECTING FAST-ACTING INLINE FUSE 300-VOLT, 15-AMP. BUSSMAN GLR-6 NON-REJECTING FAST-ACTING INLINE FUSE 300-VOLT, 6-AMP. COOPER BUSSMANN LPS-RK-3SP DUAL-ELEMENT TIME-DELAY CLASS RK1 FUSE, 600V, 3A. COOPER BUSSMANN LPS-RK-4SP DUAL-ELEMENT TIME-DELAY CLASS RK1 FUSE, 600V, 4A. BUSSMAN GLR-12 NON-REJECTING FAST-ACTING INLINE FUSE 300-VOLT, 12-AMP. 200 AMP /// 7 00VAC 650VDC /// POWR GARD. NEED YOUR ITEM FASTER ??. Not usable in Positect; Manufacturer Series - Positrol. BUSSMAN GLR-3 NON-REJECTING FAST-ACTING INLINE FUSE 300-VOLT, 3-AMP. LITTELFUSE KLLU-601 TIME-DELAY HI-INTERRUPTING FUSE, CLASS L, 600V, 601A. COOPER BUSSMANN PVS-R-300 FAST SOLAR PHOTOVOLTAIC CLASS RK5 FUSE 600V, 300A.